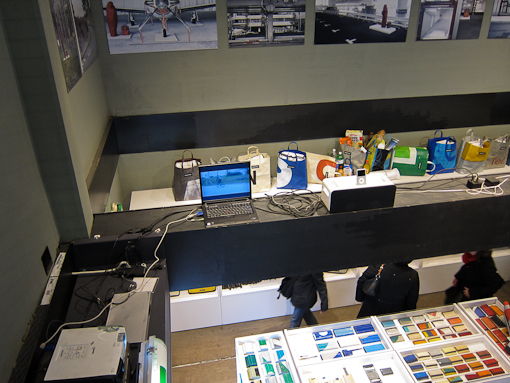 We just moved – from Neuchâtel to Lausanne – actually been here for 2 weeks already but did not have access to the internet until Swisscom gots its act together last week. That partially explains why there were no blog post for a while. In this past 2 weeks, beside moving our stuff to the new place, we received and unpacked our belongings from the US which had been in storage for the last 6 months. We also took delivery of our car but currently do not have a parking space – it is parked on the city street overnight. I also spent 3 days in Munich and then Sis came to stay with us for a week. 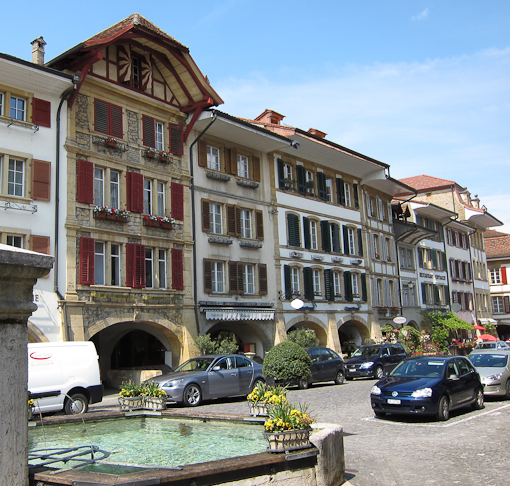 While she was here, we went furniture shopping and took day trips from Lausanne to La Chaux de Fonds, Bern, Vevey and Yvoire (by boat from Nyon). As if there were not enough traveling, I will be heading to Washington DC on Sunday. So I have little time to update the blog. 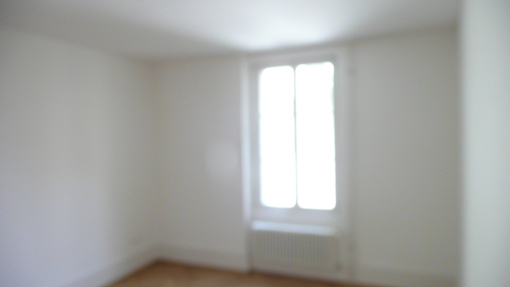 But do check back soon though as I have a backlog of stories and pictures to share, including pictures of our new place ! 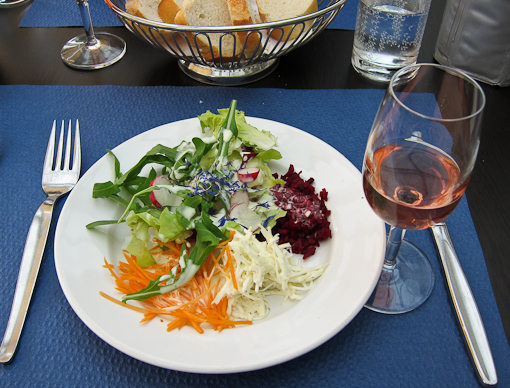 When we got to Les Brenets and then the banks of Le Doubs, it was already lunch time. 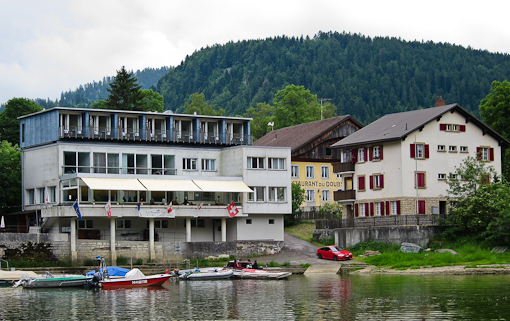 After we bought tickets for the river cruise, we decided to try the restaurant at this dull-looking hotel next to the pier – Les Rives du Doubs. 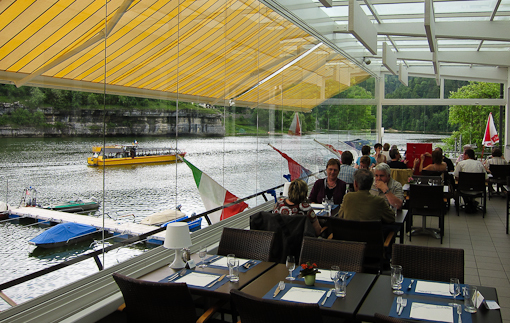 It was a surprisingly pleasant restaurant which had a modern glass-covered dining room that overlooks the river. From there, one can see the French village on the other side of the river and all the river cruise boats going back and forth. One thing I noticed in Switzerland is that if there is a scenic spot, there is usually a somewhat decent restaurant no matter how remote is the location. 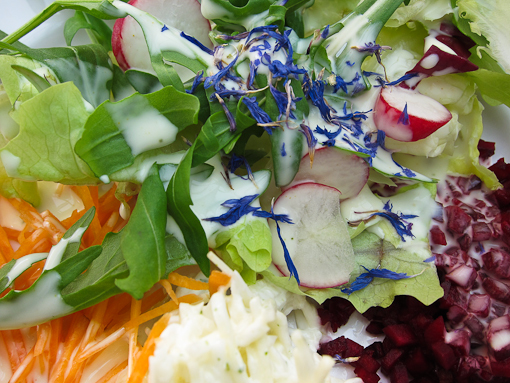 There are no mid-priced restaurants – it is either a cold sandwich or a full blown meal with wine and dessert. 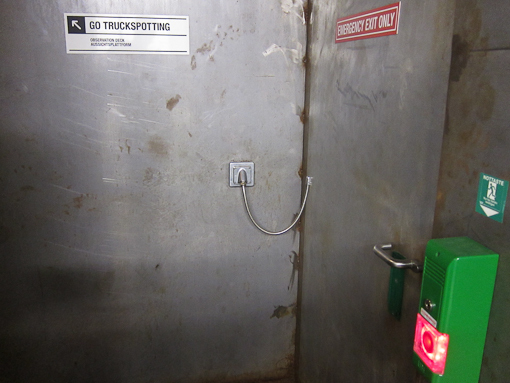 We encountered these establishments frequently. Now, I appreciate the usefulness of a Michelin touring guide which exhaustively describes all these restaurants in tiny villages. 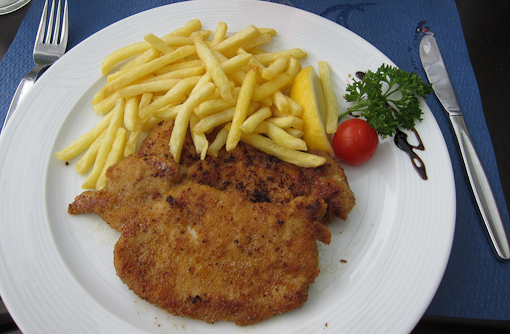 It is fun to explore the countryside and discover the local cuisine. Unexpectedly, a young Chinese waitress came up to introduce herself at the restaurant, and we talked for a bit in Mandarin and English. She turns out to be a hotel management trainee who is learning French and interning at this restaurant during the summer. 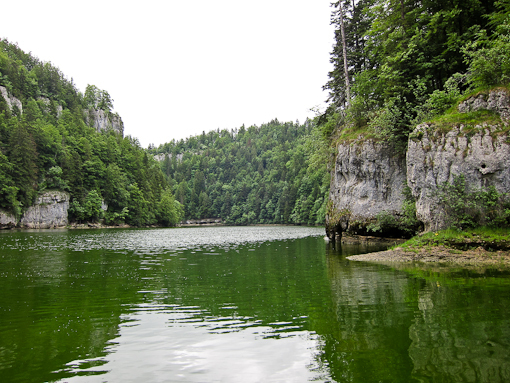 Le Doubs is a small river that separates France from this corner of Switzerland. It is about 45 minutes from where we live. 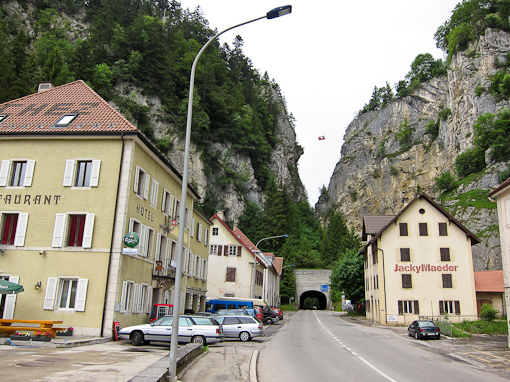 We crossed over the Jura mountains, went through La Chaux de Fonds and Le Locle, and pass through this gap in the mountain (Le Col des Roches) to reach Les Brenets. There is a Swiss flag suspended above the gap and a tunnel. Beyond the tunnel is the border which is one of many quiet checkpoints in the area. Les Brenets sits on the Swiss bank of Le Doubs. 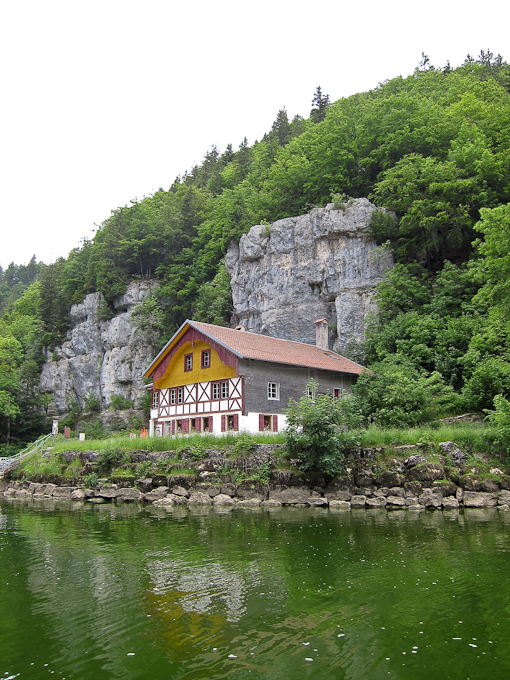 A small river cruise boat runs from Les Brenets to an outpost on the river at which point no boat can pass because of a waterfall further downstream. 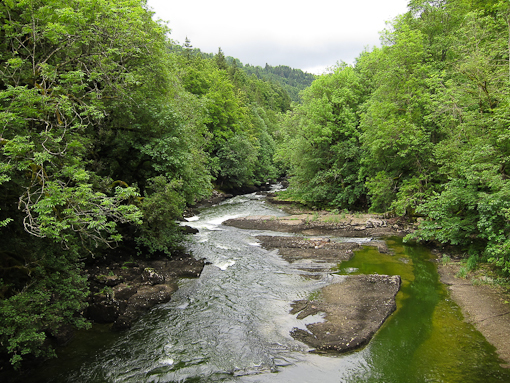 At the outpost, we crossed a bridge to the French side and walked down a path to view the waterfall. 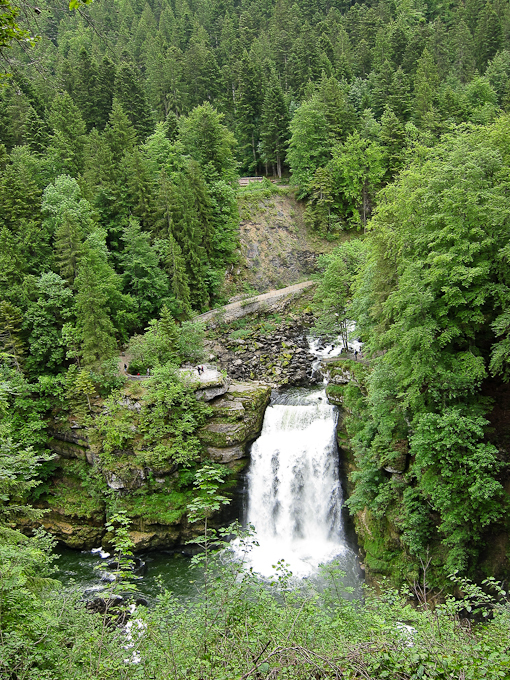 It is a small waterfall relative to the ones we saw in Iceland, but it is surrounded by forests that are dense, dark and cool. There are hiking paths all over the place. 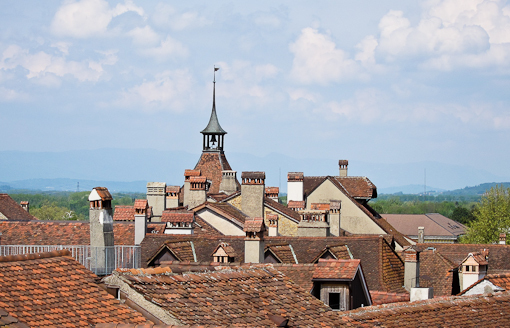 The French side has several souvenir shops, a beer garden and a restaurant – much more commercial than the Swiss side. If the price were not shown in euro, one would not know that a border has been crossed. 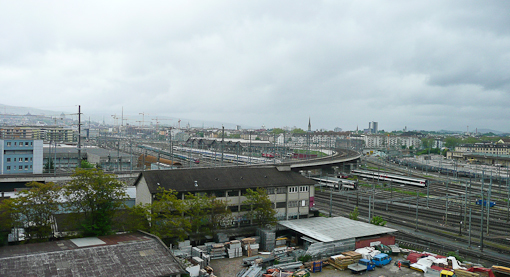 The Swiss side has a notice about customs but there are no custom house in sight. 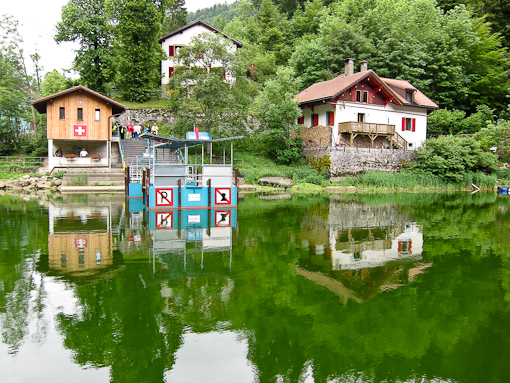 The river is remarkable in two respects: it is bright green – due to algae I presume – you can not see the bottom, and it apparently freezes in winter, making it one of the largest skating surface in Switzerland. This area of Switzerland is known as Little Siberia as it is consistently the coldest in this country during winter (if the alpine peaks are not counted). 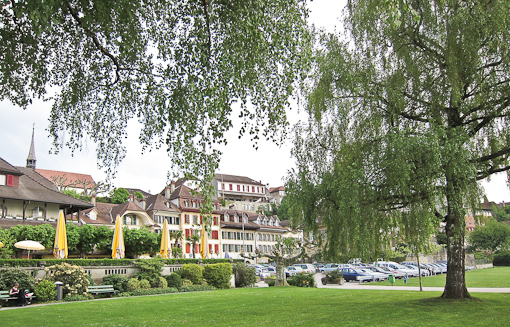 Murten (or Morat in French) is a small town on the shore of Murtensee (Lac Morat) – one of the three lakes in the area. 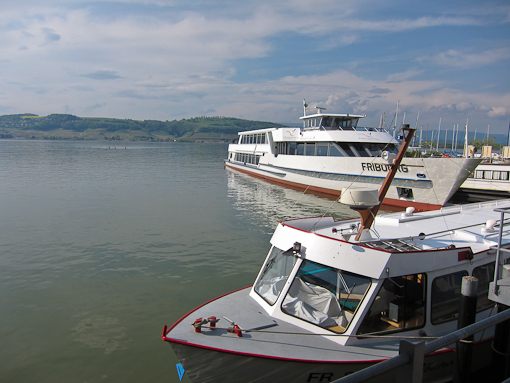 The other two are Lac de Neuchâtel (the largest) and Lac Biel-Bienne. 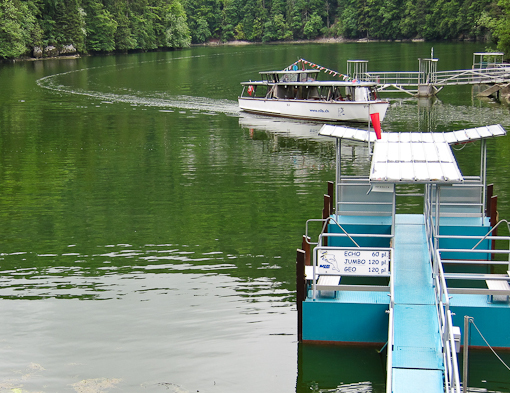 All three lakes are connected by canals and cruise boats take tourist to all of them. 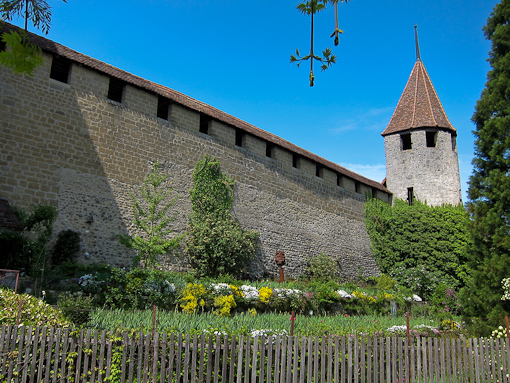 Murten is in the canton of Fribourg and German is the predominant language spoken here. 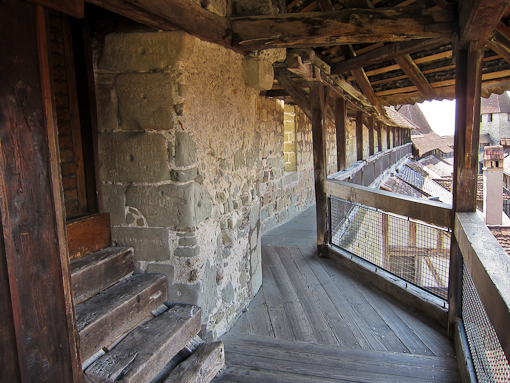 One weekend we went to Murten by car, it took about 35 minutes from Peseux. 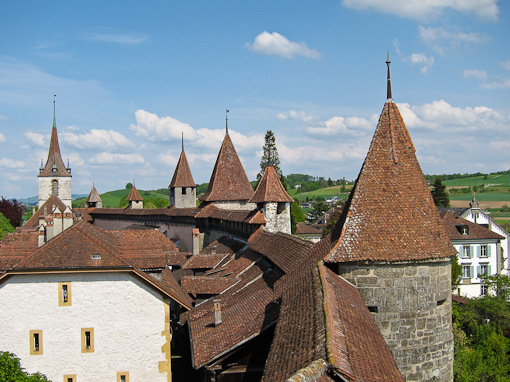 The old town is very well preserved with a castle, old city streets and a ring wall. 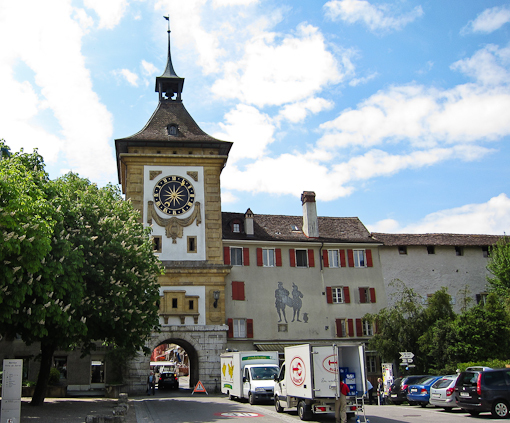 Like many of the medieval swiss towns, there is a massive clock tower which marks the main gate through the wall where one enters the town. The old ring wall has been repaired and we were able to walked along the top of it, with a view of the roof tops of houses inside and the fields outside. More old homes and a traditional hotel line the lake front. 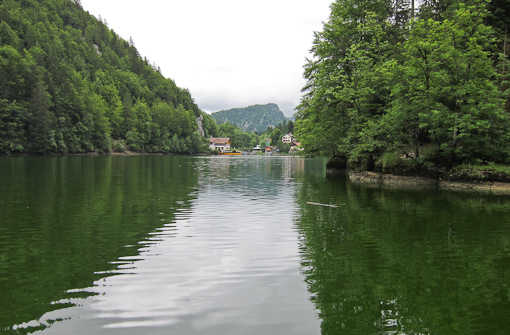 It is very picturesque – a bit touristy but still authentic. While we were there, the town was having a kind of antique fair with a children’s choir, and the area’s vineyards and farms were hosting a tasting on a boat and the lake front. We bought some cakes, a big box of apple juice and got a free bottle of wine. 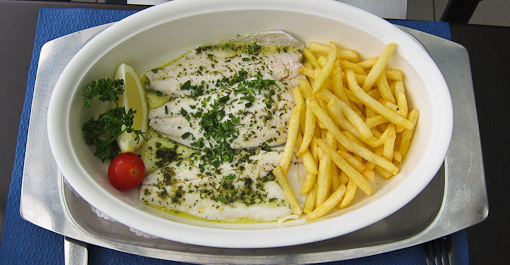 We had a simple lunch in a restaurant of the region (canton Fribourg). I will go back again for their fondue (someone had it and it looked delicious). Well, I was not planning to devote another blog post to these three books but there seems to be a lot of interest in them. This trilogy is kind of the Harry Porter for grown ups and apparently Lisbeth Salander has become a media/culture figure first in Europe and now in the US. I am guilty of feeding the frenzy here. PK kindly pointed me to a piece by Nora Ephron (director of “You’ve got mail”) in the New Yorker titled “The Girl Who Who Fixed the Umlaut“. She made fun of the characters and the style of the writing. It is pretty funny and she has a point. But the author is dead and cannot defend himself … or it should be considered a tribute. He was cradling an iBook in his arms. She looked at him. He looked at her. She looked at him. He looked at her. And then she did what she usually did when she had run out of italic thoughts: she shook her head. Click the link above and read the rest. While I was browsing, I also discovered that the trilogy is being remade just as I speculated, by David Fincher who directed Alien3, Se7en, Fight Club, Zodiac and The Curious Case of Benjamin Button. I think it is a good match given the atmosphere of the books and Fincher’s directorial style. IMDB is reporting that Daniel Craig (James Bond) will play the male lead (Mikael Blomkvist) but I am surprised that Brad Pitt is not given his involvement with Fincher’s movies. Carey Mulligan (who ?) is rumored to be the Girl but I think Keira Knightley (“Pirates of the Carribean”) will do nicely. While at a NYC airport, I picked up Entertainment Weekly’s 20th anniversary issue . It has been in the bathroom for a few weeks, and one of its feature is a list of 100 greatest characters of the last 20 years. I just read that Lisbeth Salander is No. 98 ! Narrowly beating Beatrix Kidoo at No. 99, in case you forgot, that is the Bride in Quentin Taratino’s Kill Bill who was played by Uma Thurman. 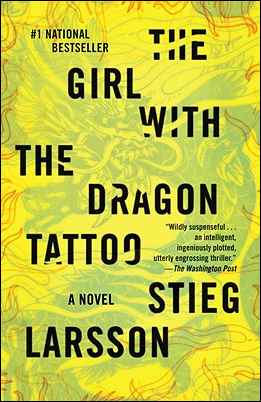 Finally, the New York Times Magazine of May 17, 2010 published a well-researched article on the trilogy, the author, and its future – “The Afterlife of Stieg Larsson“. These are the book covers for UK’s release of the Millennium Trilogy. The book covers in yesterday’s post are used in the US editions. I prefer the US covers. The author of the Millennium Trilogy died in 2004 several months after he submitted the trilogy to his publisher and before the first book was published. He was only 50, too bad that he never realized he was the second best-selling author in the world in 2008. He was a journalist-writer who started a foundation to counter the extreme right wing and racist organizations – that experience is put to good use to set the scene in the books. Apparently, he had a plan for a series of 10 books and a 4th book was half finished when he died. His longtime girlfriend wanted to finish it in a way he would have. Since they were not married, she has no right to the books and the author’s father is blocking her from doing so. I suspect that there is a lot of money involved given the success of the trilogy. I will buy a copy of the 4th. Although the movies had already been made in Swedish, I would not be surprised if Hollywood wants to remake them in English. Here are some more trailers I found on Youtube. 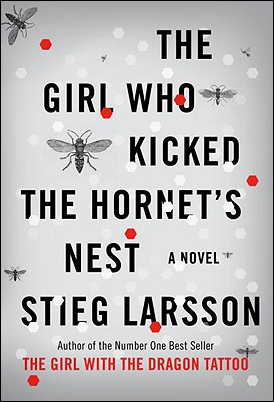 I just finished the third book of the Millennium Trilogy by Stieg Larsson at around 2am Thursday night. 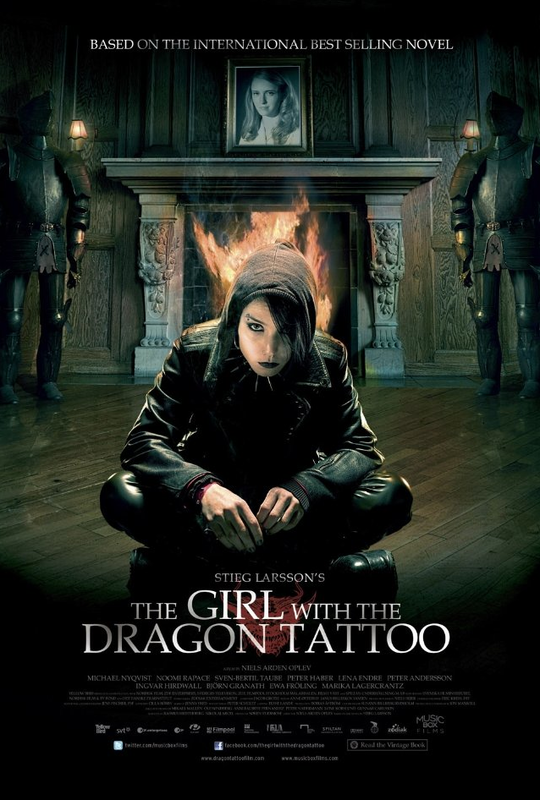 The Millennium Trilogy consist of “The Girl With The Dragon Tattoo“, “The Girl Who Played With Fire“, and “The Girl Who Kicked the Hornets’ Nest“. 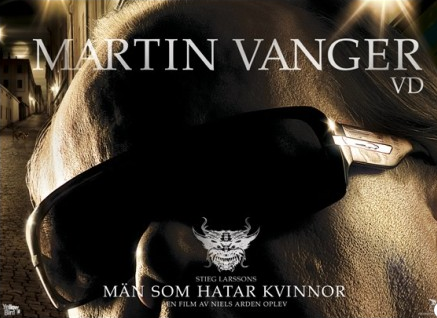 The contemporary crime-thrillers originally published in Sweden in 2005-2007 were translated into English and became international hits. I started reading the first book by chance since I wanted to try out the new Nook I brought back from the US. I’m glad that I had the Nook because it would be frustrating if I have to find the other two books in English here. As soon as I finished the first, I just bought the next one online immediately. It was very good, although no literary masterpieces, the stories are gripping and kept me guessing. The first story is self-contained while the second and third book told one long story. The characters are well drawn and I liked the detailed geographic locations the books provide throughout. Now I feel like visiting Stockholm just to see where the characters lived – well, I checked out the addresses on Google Earth anyway. 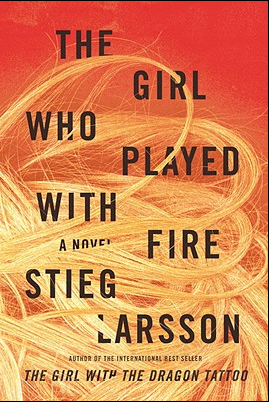 The first book “The Girl With The Dragon Tattoo” was originally named in Swedish “Män som hatar kvinnor” (Men who hate Women) while the third book was named “Luftslottet som sprängdes” (The Air Castle Which Exploded). The title of the second book is faithfully translated. All three had been made into movies and are also appearing as a TV series. 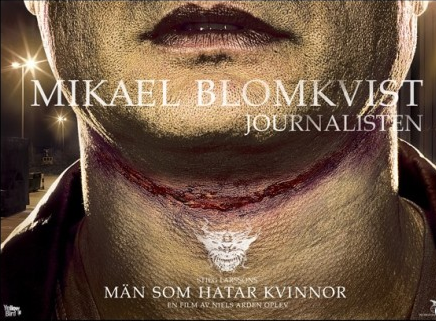 I would be interested in seeing them albeit in Swedish with subtitles. Here is the trailer and poster for the first movie. More trailers tomorrow. 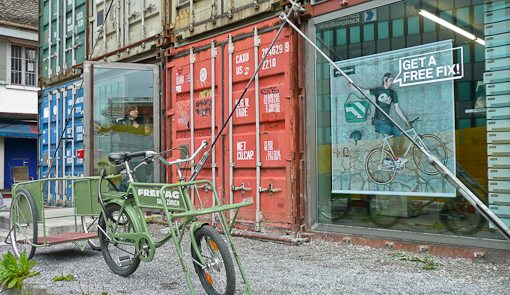 Freitag is a company that makes unique messenger bag out of tarp recycled from trucks, old seat belts, used airbags and bicycle inner tires. Each is cut by hand, the design of which keeps some of the original graphics (recontextualized as they say), and is therefore a one-off design. 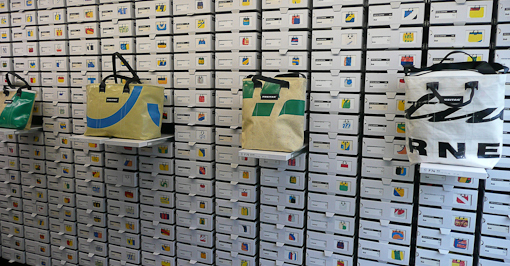 Apparently, MOMA acquired one of their bag for its permanent collection. 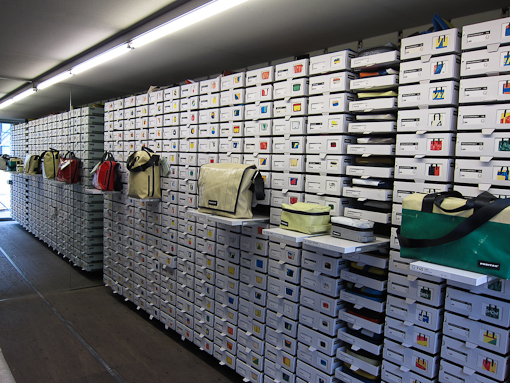 The company started in 1993 by two bike-riding designers living next to the truck route in Zurich … Check out their site which tells the full story of the company. 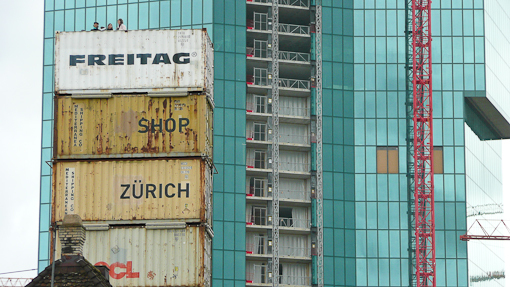 Their flagship store located in Zurich West is really a stack of 5-6 containers bolted together with an internal staircase. I suppose hurricane or typhoon is not an issue here. 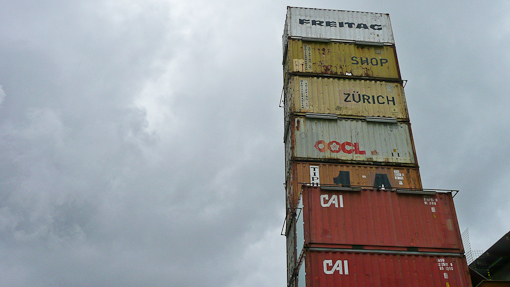 Part of the uppermost container has been cut away and is used as a truck-spotting platform where one can observe the spaghetti railway lines and highways leaving Zurich. Not at all intending to shop when we went, but at the end, we each bought a bag. 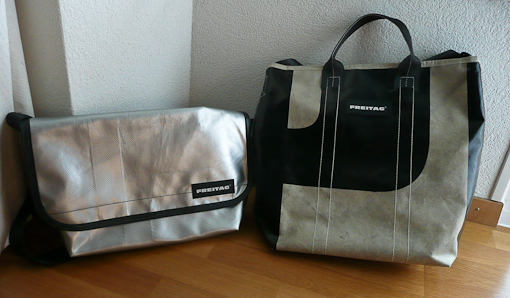 Despite the riot of brightly colored design on offer, we both ended up with one that is somewhat monochromatic. Mine is the one that looks particularly dirty which it really isn’t. Mirrors doubled the length of the container.